So I received a surprise in the mail over the weekend. Apparently I ordered an awesome Sycamore Box from Ray Jones during his Save the French Broad River Project. It’s a wonderfully sized BX-03 which will hold roughly 3 full sets of polyhedral dice. 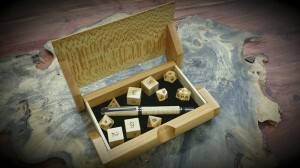 After spending the prerequisite time admiring Ray amazing craftsmanship, I was immediately struck by a pressing need to build a pen and dice set to go with this box. So I spent the next hour or so sorting though my wood library rejecting wood after wood in an attempt to find the perfect wood to pair with Ray’s work. After an exhaustive search, I came across my stock of Figured Anegrie. 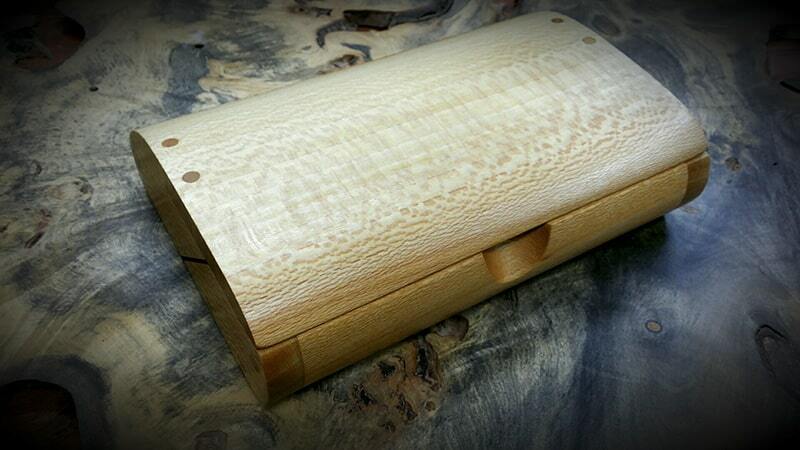 Which is nearly a dead ringer for Sycamore as far a coloration is concerned and it has a wonderful curl and shimmer. 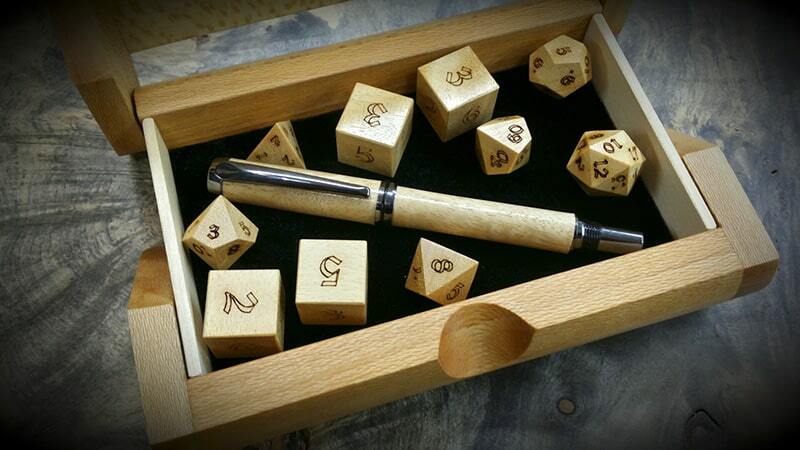 So I sat about crafting a polyhedral dice set to go with the box, while I was at it, I found a pen hardware kit I had tucked in the back of drawer to save for a rainy day, which as luck would have it, was more than perfect for this project. 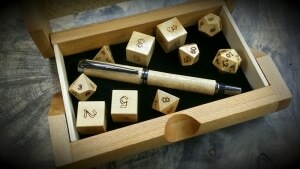 Some days the wood gods just smile down upon us, this was one of those days. 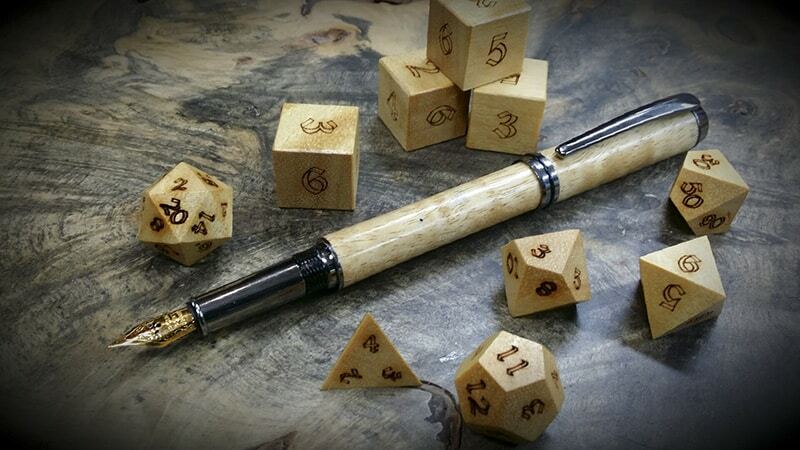 The pen I crafted to accompany this set of dice is a black titanium fountain pen. The nib is 22K gold plated with an iridium tip and uses either a replaceable ink cartridge or a refillable pump style cartridge. The dark Titanium hardware and the black accent bands contrast the blond color of the Figured Anegrie. Unlike the magnetic posting cap in our Elegance de Magnética Fountain Pens, the postable cap in this pen is threaded to fit either end of the pen. This is perfect. I also had the pleasure of some of Ray’s work showing up this week, and it’s so lovely. I’m still in the staring phase. yup he does amazing work Pirate. I can’t believe you sold this. I thought it was for you! I could see something like this being added to my GM’s shelf though. I love fountain pens and love board games please tel me I can get my hands on this set or any other in dark woods.